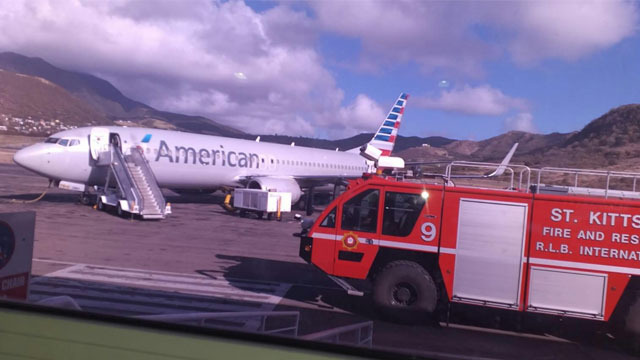 The bomb squad and fire and rescue services were summoned to the Robert L Bradshaw International airport Friday morning after a fire broke out onboard American Airline flight 1466 while it sat on the runway awaiting boarding. The flight was scheduled to depart St. Kitts for Miami at 8:30, however passengers reported seeing the airport’s fire tender race to the airplane sometime around 8 am. One passenger told Freedom FM that airline staff informed that the flight would be delayed as a piece of luggage in the baggage compartment had caught fire. A fire extinguisher was reportedly used to out the fire and all the luggage was removed and taken to the far end of the runway where they were searched by the bomb squad and other responders. Just before 11am the pilot reported that the cause of the fire was an e-cigarette charger in one of the bags, however all luggage had been checked and rechecked and an all clear given. The passengers were informed that they would have to wait until personnel was able to fly to St. Kitts from Puerto Rico to clean the affected area and determine if the aircraft was safe to fly or if the flight would be canceled. According to the individual, passengers were told they would be updated approximately 3 hours later.